Place the figs in a saucepan with the apple juice and water, and cook over medium heat until soft and plump. Remove from the heat and set aside to cool. Preheat the oven to 180°C/160°C fan-forced. Butter a 25-centimetre round cake tin and sprinkle it with some almond meal, or gluten-free flour. Pulse the figs in a food processor with the cognac until they are a fine purée. In a large bowl, whisk the eggs and sugar together. Add the fig pulp and mix thoroughly. Add the almond meal, baking powder and salt, and combine thoroughly. Leave the batter to rest for 10 minutes, then pour it into the prepared tin and bake for 1 hour or until a skewer inserted in the middle comes out clean. Remove from the oven and cool on a rack. To make the icing, pulse the ricotta, vanilla extract and icing sugar in a food processor to a creamy consistency. When the cake is cool, generously ice the top of the cake with the ricotta mixture. 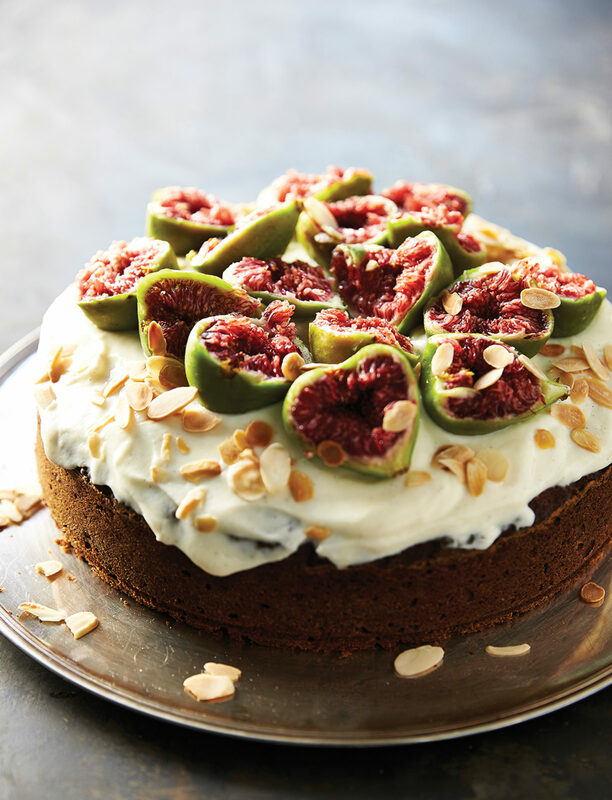 Tear the fresh figs in half and pile on top of the cake, and finish with the flaked almonds. Slow-roasted Shoulder of Lamb is a family favourite. It is the hero dish we make on Easter Sunday. The aromas of the lamb, garlic, lemon and herbs permeate the kitchen as it slowly cooks. After the long period of fasting from any meat product, we await anxiously to sit at the table to enjoy the succulent lamb. That said, I do cook this dish at other times throughout the year as well, especially if I’m entertaining for lunch or dinner. Get the latest Sweet Greek news and recipes by signing up to our newsletter.